This program is designed to be completed during the 6 weeks directly prior to you taking the official PFT. The training plan will follow a basic 5-day per week, format. The Final (6th) week is an unload or “taper” week, with reduced volume to allow recovery before taking the FBI Special Agent PFT. You’ll take the complete FBI SA PFT three times … at the beginning, in the middle, and at the end. Each time the program uses your most recent PFT scores for the follow-on progressions. In this way the program automatically “scales” the incoming, and improving fitness of each individual athlete. No matter your incoming fitness, this plan will push you. The training sessions are designed to around an hour. The first, 3rd and 5th Mondays of the plan you will perform 2-a-days (two sessions per day). In the morning you’ll take the FBI SA PFT, and in the evening, you’ll complete sets of push ups, sit ups and based on your PFT results followed by a 2-4 mile run. During this program, every number of calisthenics repetitions you perform is based on the number of repetitions you completed at your most recent FBI SA PFT. Athlete performs 50x Push-ups on FBI SA PFT No.1 (Session 1). – 30% of 50x Push-ups is 15 (.3 x 50 = 15). – Set a repeating countdown timer for 75 sec. – On Round 1, do 15x Push-ups with continuous motion, then rest for the remaining time in the 75 sec. interval. The faster you finish, the more rest you get before beginning Round 2. – When Round 1’s 75 seconds is up, immediately begin Round 2 by completing 15x push-ups with continuous motion and proper form, then rest for the remainder of the 75 second interval. – Repeat this through 6 Rounds. During testing, you are required get close enough to the ground so that you have a straight line from the center axis of the elbow to the center axis of the shoulder, and return to the top, elbows locked, position of the push up. Your entire body must move as a unit. The only regulation on hand position is that the hands cannot be placed more than two hand widths outside of the shoulder blades. There is a little wiggle room for moving them, so don’t get used to picking up your hands, or moving into many different positions. We emphasize doing each rep perfect from the start, because risking “no reps” will kill your score by wasting precious energy. Strategy: FBI SA PFT push-ups are a continuous motion exercise. Unlike most military tests, athletes are not allowed to rest in the up or down position. Any resting will result in the termination of the test. Start with a brisk, but not frantic pace. As you begin to fatigue and slow it is vital that you learn to continue your push-up movement until you reach true failure. Keep fighting! During testing, your fingers must be interlocked behind your head. The knees must be positioned at 90 degrees. A full sit up requires your shoulders to make full contact with the floor, and then return to the full upright (vertical) position. Your hips must also stay in contact with the floor at all times. Do all of your sit ups with this form. You will also have someone to hold your feet, so do your sit ups with feet held stationary and anchored during this program. You cannot rest in any position during the 60 seconds. You must have constant movement. 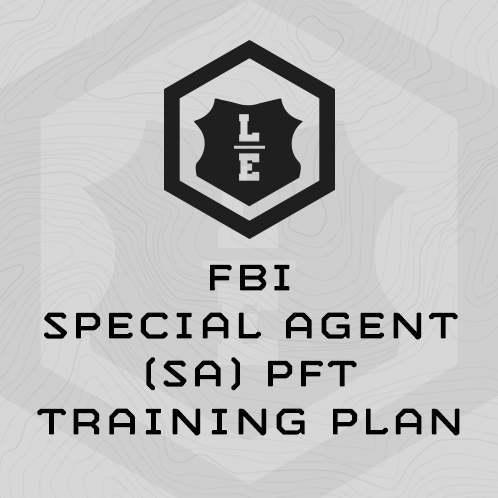 The FBI SA PFT tests your running ability with a relatively short 300m sprint, and a longer 1.5 mile run for time. Speed Over Ground – You’ll run hard, fast 400m, or 800m repeats, four times/week. The pace for your intervals will be scaled to your 1.5 mile assessment pace. Aerobic Endurance – You’ll run an moderate paced 2-4 miles twice per week (Monday & Wednesday). The program includes scaled paces for your runs. These paces are based on your most recent 1.5 mile run assessment results (again, Sessions 1, 11, and 21). In this way, the plan automatically “scales” to your current running ability, and is always pushing you to improve. Use the latest assessment results to determine paces for subsequent training sessions. Running area (track or other) with known 400m, 800m and 1.5 mile distances. If you miss a day, make up the session you missed the next day and follow the programming as prescribed. Don’t skip ahead. If needed, train on a Saturday to stay on schedule. I can’t make all my rounds of sit ups or push ups unbroken. It it okay to break the prescribed reps into sets? Yes for the sit ups. Break as necessary to complete your reps, but don’t extend the 75 second interval. Push ups – rather than breaking the reps into sets, if you are having trouble completing the prescribed reps, go to your knees and try to complete them on your knees before breaking to rest. Don’t extend the 75 second interval. This is a difficult progression … don’t be surprised or embarrassed if you have to go to your knees. What if I’m having trouble completing the running repeats/intervals? Extend the rest period by 60 seconds, and try again. Keep fighting. Expect to be pushed. How much rest should I take between finishing this program and taking the official PFT? 2-3 days total rest. Week 6 of the training plan tapers back the intensity. How far out from my PFT should I complete this plan? Complete this training plan the six weeks (plus 2-3 days for rest) before your official PFT. Can I repeat this program? Yes, but we recommend you take at least a week full rest if you plan to complete it back to back. How much improvement should I see? 15-40% in overall score depending upon your incoming fitness. Fitter athletes will see less overall improvement. Less fit athletes will see greater overall improvement. "Rob!!! I went from an 18 on my FBI PFT self test to a 26 on my official test day! I went from 43 sit-ups to 49, and out of nowhere got a perfect 10 on my 300 sprint clocking in at 40 seconds! I followed the program to T, and while I had my moments I completely trusted the program and it paid off. Thank you thank you!!!" "I bought your 6 week program for the FBI PFT and let me just say thank you! I have made some really awesome gains the last few weeks! It hasn't been easy, most days I was cussing your work out plan under my breath!!"